The last time the Americans were trusted with the Godzilla franchise did not end well. Any fan of the king of the monsters remembers Roland Emmerich's gargantuan turd from 1998 fairly well; but for all the wrong reasons. Thankfully, the second attempt at bringing the iconic lizard to US screens is in the hands of new filmmaker Gareth Edwards; it seemed he couldn't fail after producing the brilliant Monsters on such a low budget in 2010, and believe me, he has lived up to all expectations. 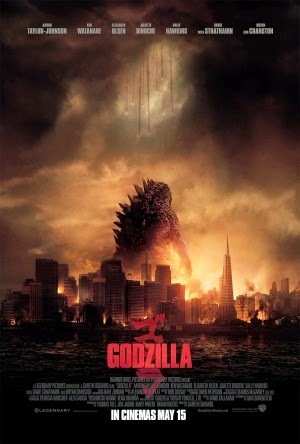 Godzilla features the titular beast as a powerful force of nature, coming to the aid of humanity to restore balance when creatures aggravated by our scientific curiosity threaten the future of our race. Caught up in the chaos is bomb disposal technician Ford Brody (Aaron Taylor-Johnson), whose father Joe (Bryan Cranston) becomes obsessed with discovering the truth after his wife is killed in an apparent 'natural disaster' - though Joe knows something is being hidden, and his actions lead to the eventual revelation of the truth as further disaster begins to unfold. The trailers for Edwards' new take on Godzilla have washed away the terrible taste of the 1998 film, and the film itself should purge all memories of its existence. In the style of classic monster hits such as Jurassic Park and Alien, Godzilla uses the presence of its titular monster to create tension and reveal its effects on the terrified characters. The slow burn pacing means we focus on the human characters, which are fleshed out to more than generic screaming citizens panicking and running. We seldom see the titular creature for the first hour, and he probably has around 20 minutes of screen time in total - this sounds horrifying, but trust me, it really works. Godzilla has a certain character and personality to him, being more faithful to the original concept of a godlike being who restores balance to the natural way of life. Edwards has lately impressed us with his talent in the field of CGI special effects and with a $160 million budget behind him this time round, the end product truly shines. The action scenes and the creatures all look fantastic, and the animation breathes more personality and believability into their portrayal. Performances across the board are generally superb, even if some characters come off as a tad bland - both Aaron Taylor-Johnson and Bryan Cranston are particularly impressive in their roles, the former effortlessly being able to play a convincing father, husband and soldier even at the young age of 23. The principal issue with Godzilla is perhaps the occasional irritating vagueness of its storyline, which could've elaborated more on the villains and the actual meaning behind Godzilla himself. This aside, this is far from a disappointment; superb pacing and awesome action make it a perfect redemption to Emmerich's atrocity and easily one of the best films of the year thus far.